Canvas work is one of the oldest forms of embroidery. One asset, in centuries gone by, was it's hard wearing quality. A hemp or linen background was completely covered by stitches, which not only decorated it, but strengthened it as well. Canvas work was used for slippers, bags, pillows, chair covers and, especially necessary in those non-centrally heated days, heavy curtains surrounding a bed. 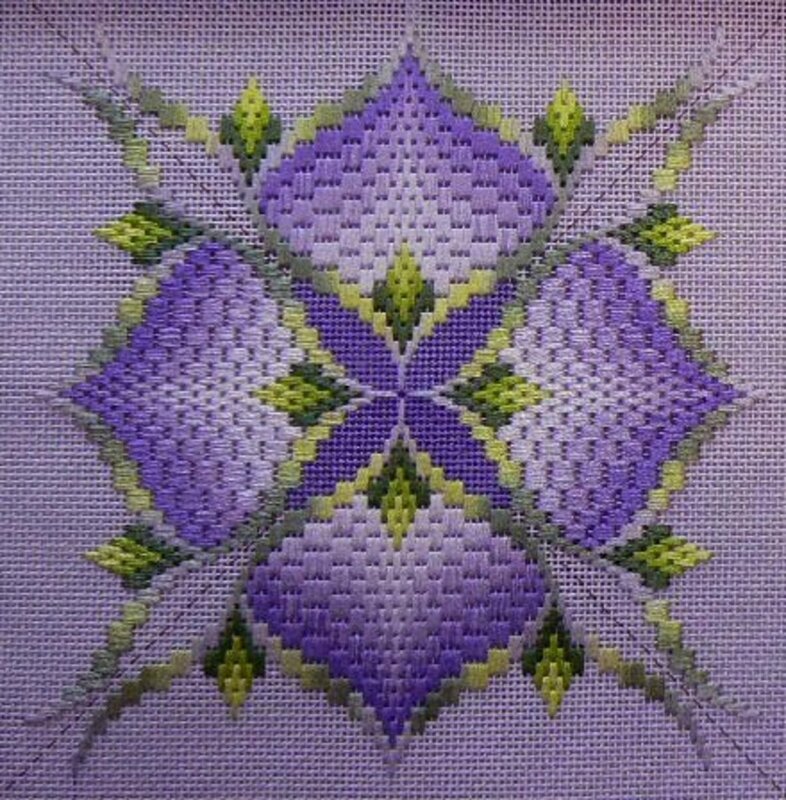 Bargello, or Florentine stitch as it is also known, is a good way of starting canvas work. The stitches used are simple, the designs, being abstract, are easy to follow and compared with many forms of canvas work, it is very quick to do. 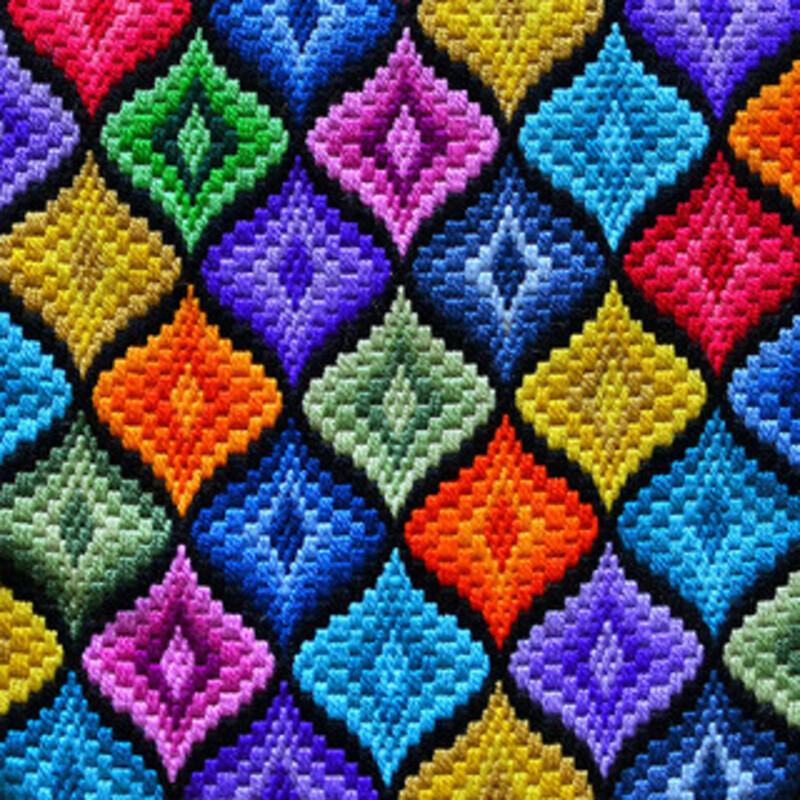 The great thing about Bargello is that it's fun, choosing colors to create different effects and making up your own designs. All the family may be able to take part too. For example, younger children might like to begin by making small objects like purses or bookmarks. General Rule - The smaller the item you are making, the more threads to the inch on your canvas. 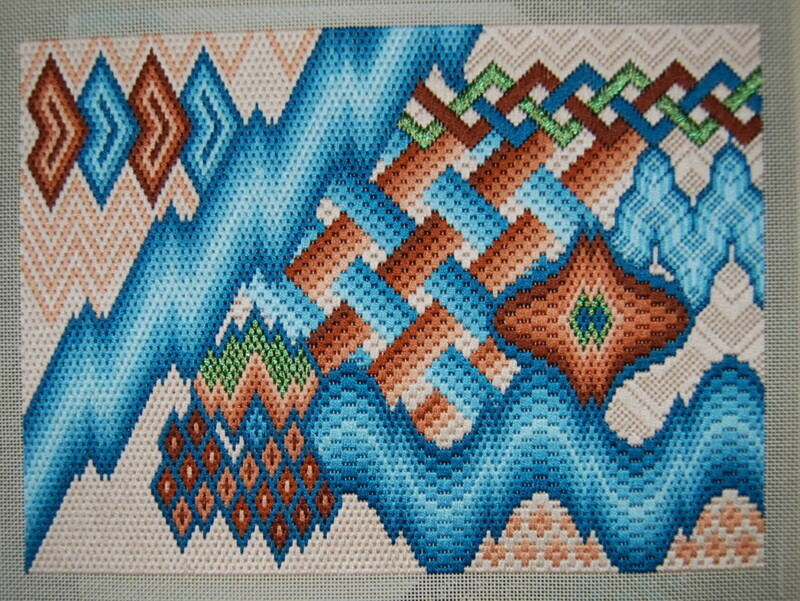 For Bargello work you need single thread canvas, also known as mono canvas. The number of threads to the inch will depend on what you are making and the thickness of the yarn or thread you are using. In canvas work, the canvas should be completely covered by the embroidery. 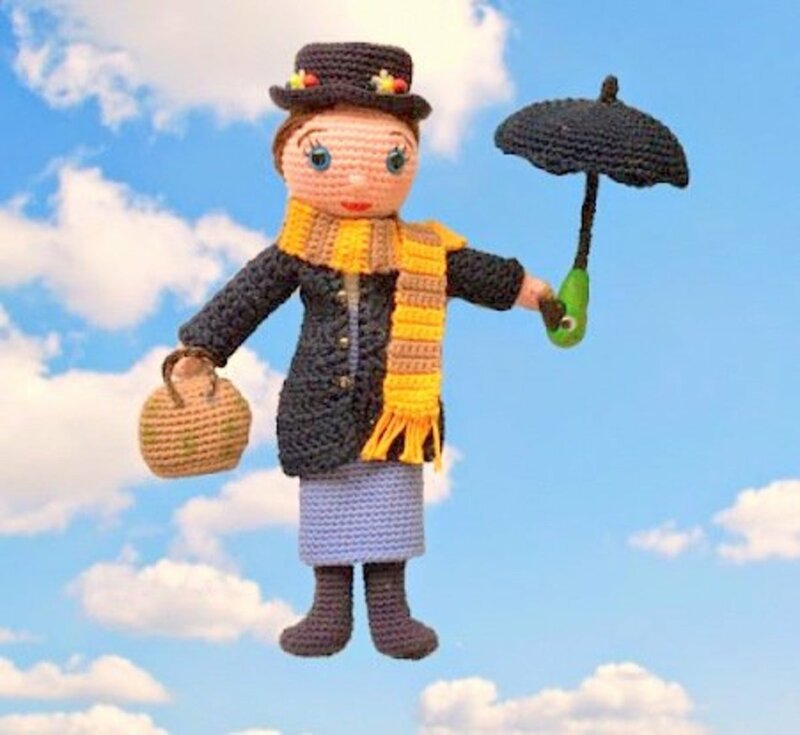 It is best to use yarn specially sold for canvas work, this yarn is usually carefully spun and will give the best effect to the finished work. For hard-wearing articles, wool yarn is best. Silk thread can be used on its own for small decorative items. It can also be used to lighten or add sparkle to a design worked in woolen yarn. 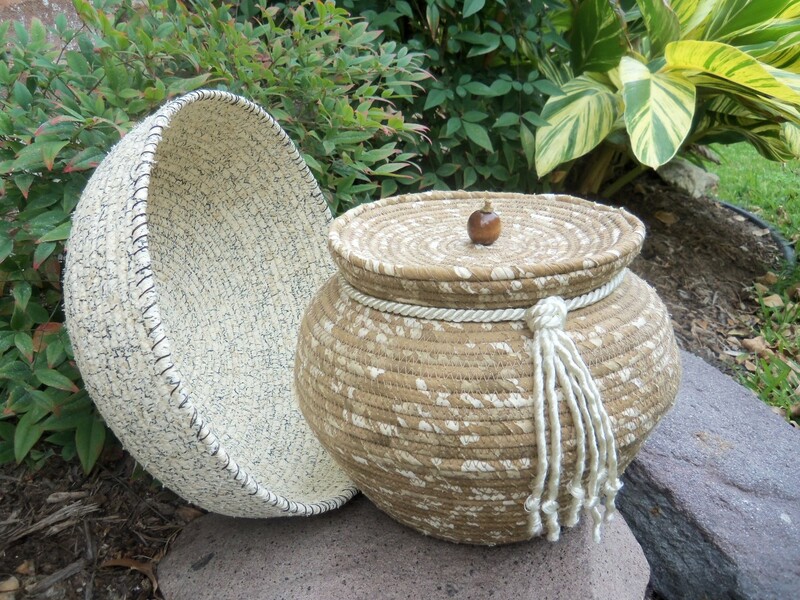 Thick cotton thread is also effective and has the advantage of being washable. Yarn has a right end at which it should be threaded into the needle. Run the yarn between your thumb and forefinger. One way it will feel smooth, and the other way, slightly rough. Thread it into the needle so that the yarn remains smooth as it is drawn through the canvas. If you use the rough end, it will have a 'hairy' appearance, rather than smooth. You will need special tapestry needles with a rounded end. Make sure that the yarn or thread you are going to use, runs easily through the eye of the needle, otherwise it will rub or break the thread. When you are cutting canvas it should be at least one and a half inches larger all around each edge than the size of the finished article. To prevent the edges of the canvas from fraying, overhand stitch all around or turn down a single hem and baste down or bind with masking tape. Never thread the needle with too much yarn or thread. A rough guide is to cut the yarn about as long as the space between your elbow and finger tips, or about 18 inches. Pull the threaded needle through to the right side leaving about an inch of yarn on the wrong side. As you stitch, catch this end into the stitches on the back of the work. 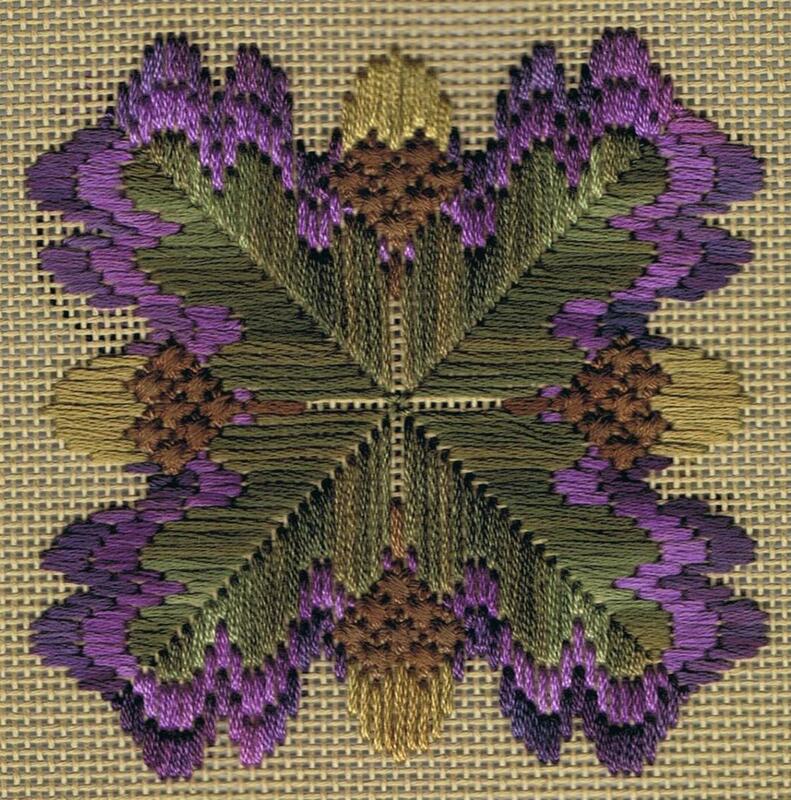 Bargello is counted thread work, so remember to count your stitches as you embroider. Basically the only stitch is a vertical one covering one, two, three, four, five or even six threads of the canvas. At the top and bottom of the design you will have to make small stitches to keep the edges of the embroidery straight. 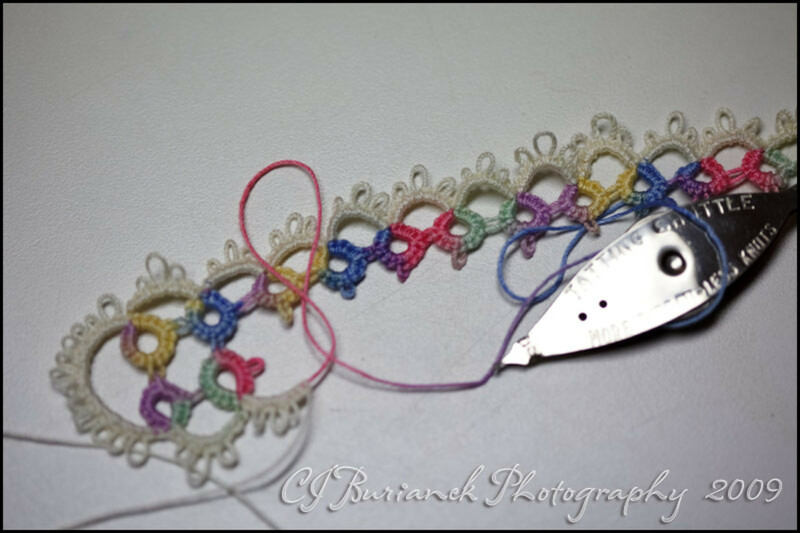 The stitches are given different names to distinguish the different formations in which the stitch is used. 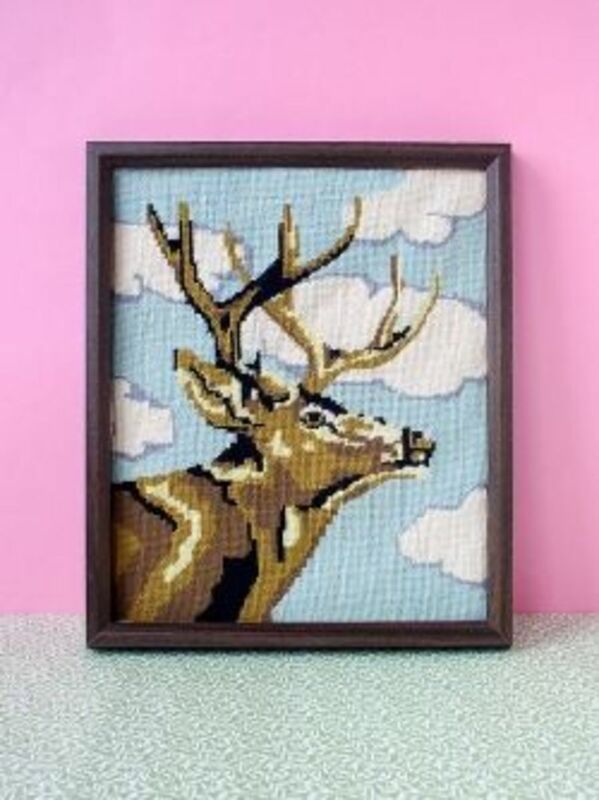 Have your or anyone in your family ever created a heirloom with Bargello? No, but what a cool craft! 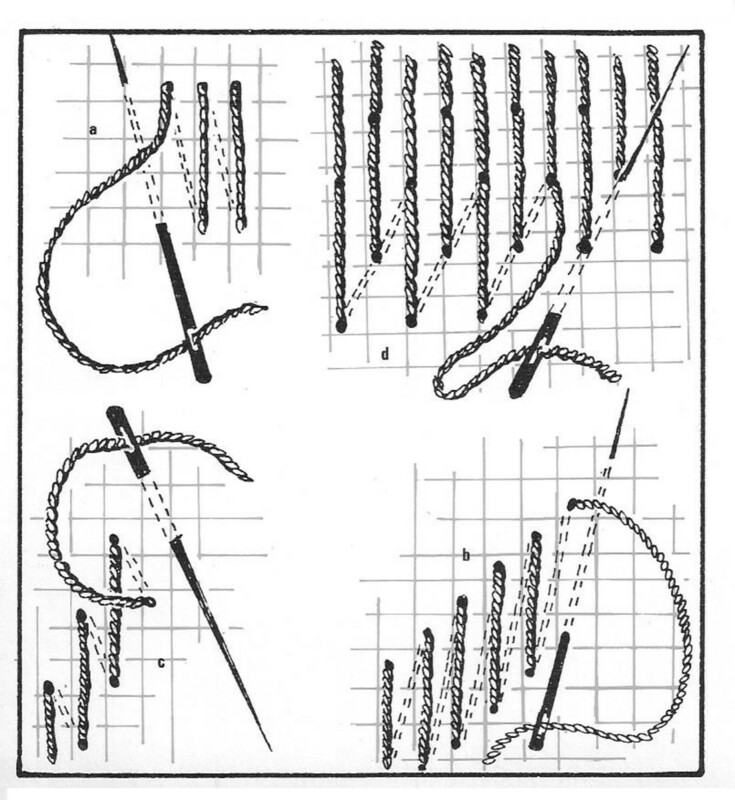 Figure 1a shows an even line of stitches each worked over the four threads of canvas. The dotted lines show the whereabouts of the yarn on the wrong side. Figure 1b shows a zig-zag stitch, each stitch covers four threads of canvas and moves up one thread from the one next to it. 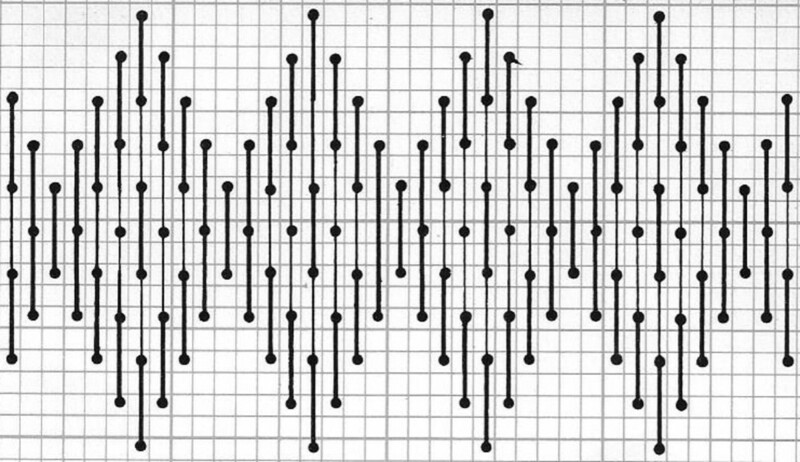 Figure 1c shows another variation, each stitch is over four threads and goes up two threads from the one next to it. 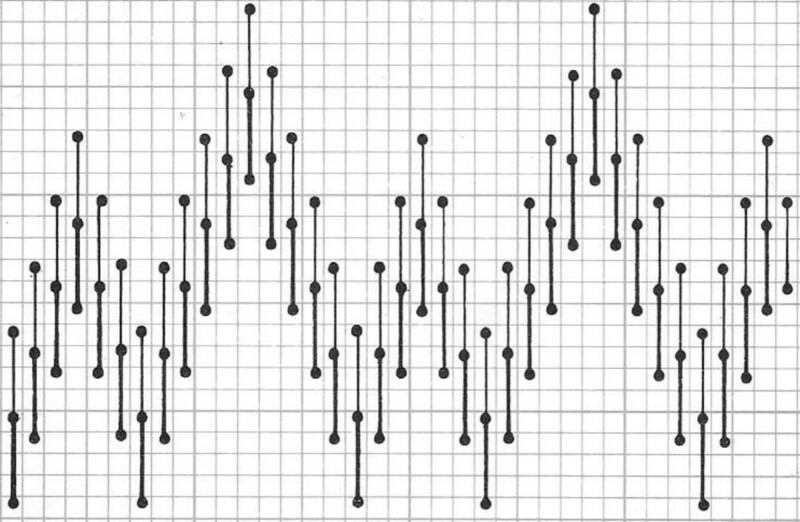 Figure 1d shows Brick stitch, which is useful for filing in with background color. Take the yarn or thread to the wrong side of the canvas and run it through several stitches. Some people like to cut their thread when it is secured, others leave it. Canvas work often gets twisted and loses its shape while it is being stitched. When the work is finished, place it, right side downwards, on a wooden board covered with a piece of clean old sheeting. Using clean drawing pins to fasten it, stretch your work to the right shape and then secure it. Pat all over the wrong side with a moistened sponge. Leave the work pinned down until it is dry. Each vertical stitch covers four threads of the canvas. 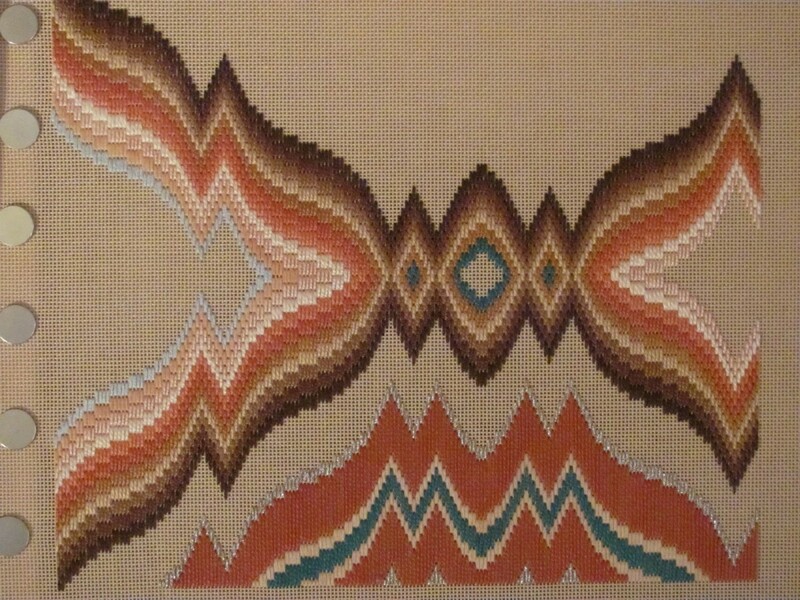 Zig-zag pattern, which is very effective in Bargello. Use two, three or four colors, or shades of the same color. This is a series of interlocking diamonds using two colors. One for the outside and very center of the diamond, another for the inside. Series of diamonds interlocking side by side, not top and bottom. In between is a simple motif. 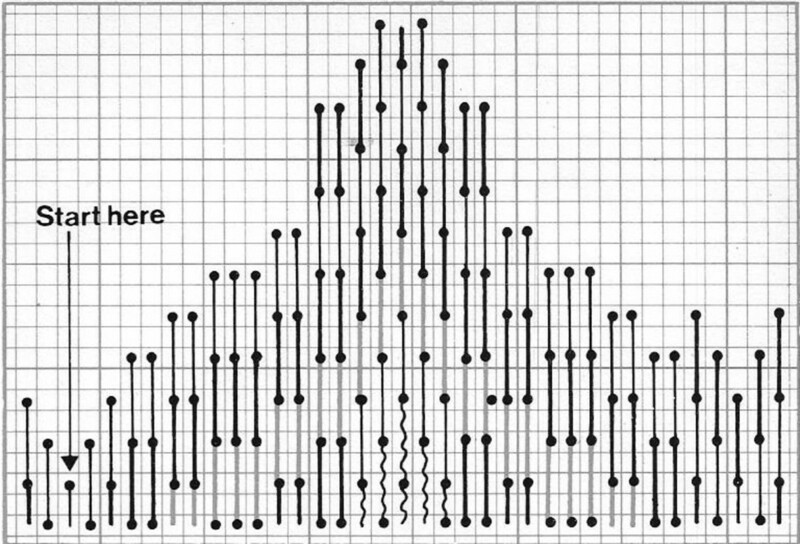 Turn the chart upside down to complete the diamonds. 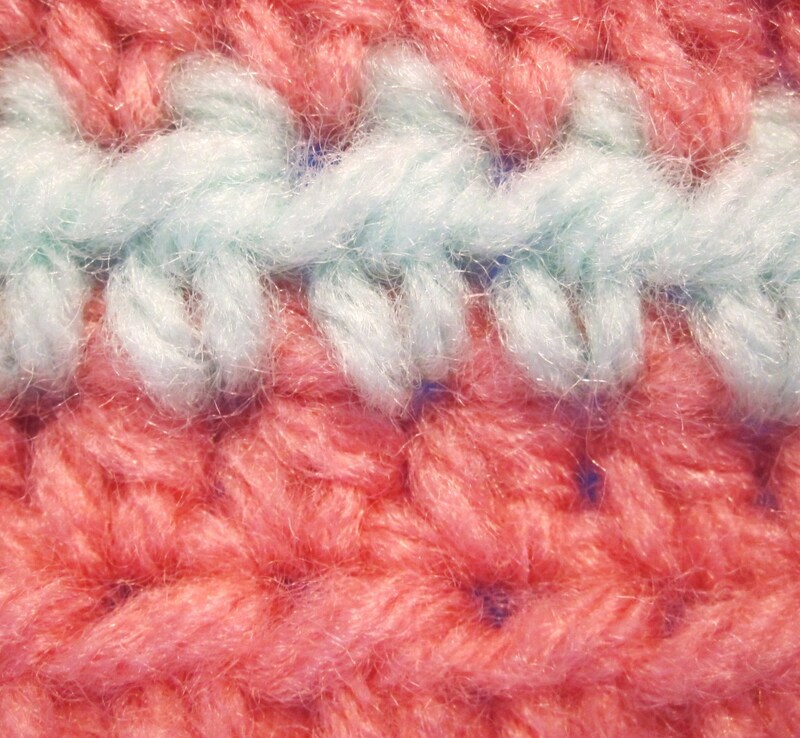 Use two colors for the stitches shown and a third for the fill-in stitches not marked. A block built up with three colors. This chart only shows one half of the design, reverse for other half. The center is on the right-hand side. Join the blocks side by side. The colors used in the photo are turquoise, gold, green, and dark turquoise. All stitches are worked over four threads, except the fill-in stitches at the top and bottom of the design. The pattern below shows the top half of the diamond. 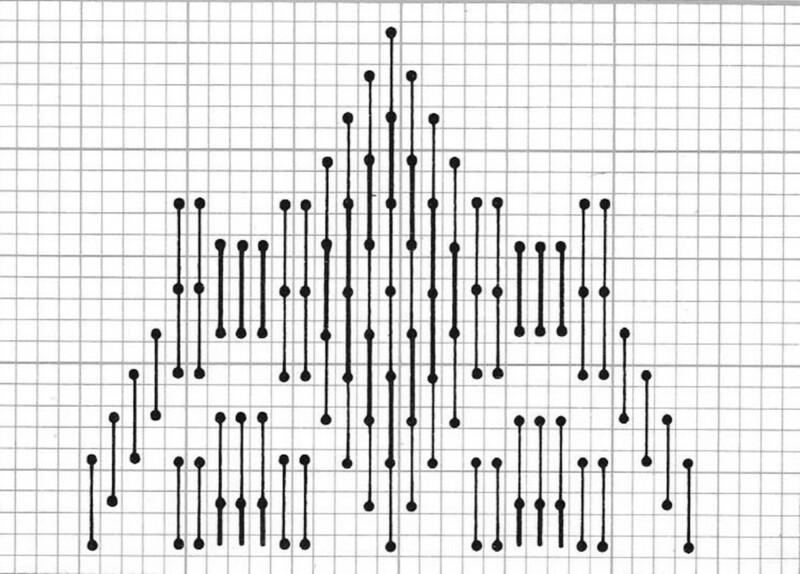 Turn the pattern upside down to complete the bottom half of diamond. Prepare the canvas as directed above. With a pencil, draw a square 13 inches wide by 12.5 inches deep, in the center of the canvas. On the left-hand side of this square, count down 20 threads from the top. Using turquoise yarn, bring the needle through to the right side and do a stitch downwards. The best way to work is to fill in the penciled square with outline turquoise diamonds. When you have done this, fill in the next row of the diamonds with the gold, then the green, and gold again. Fill in the center of each diamond with dark turquoise. 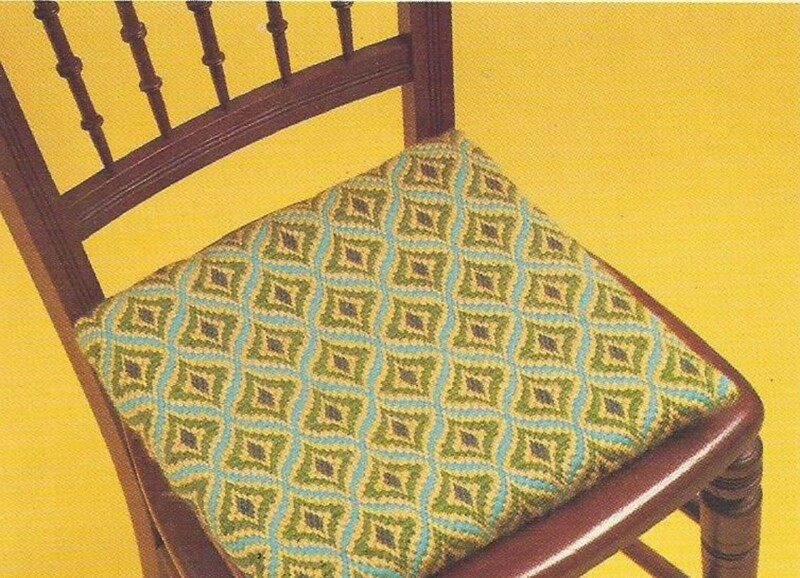 To Finish: Stretch canvas and fit to chair as required. Thank you, it is unbelievable how many different applications this can be applied to. 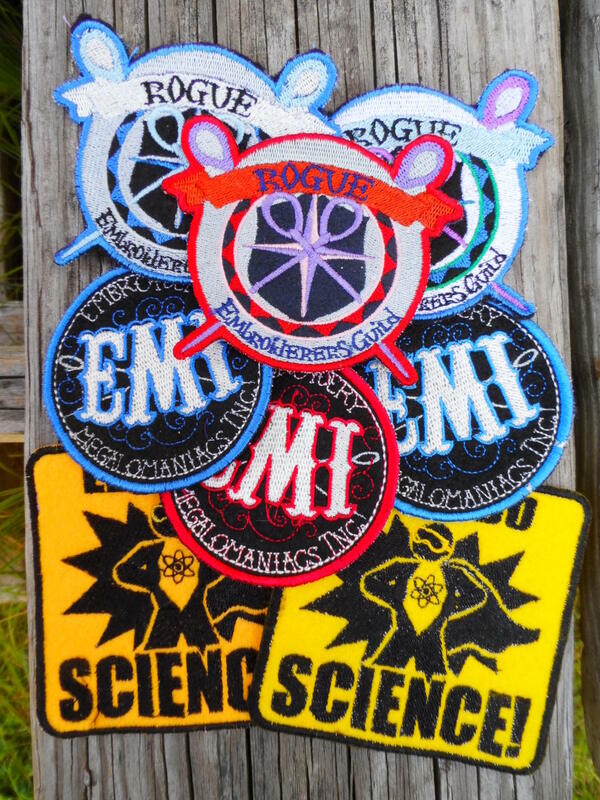 Not only embroidery, but I have seen it on quilts and jewelry. 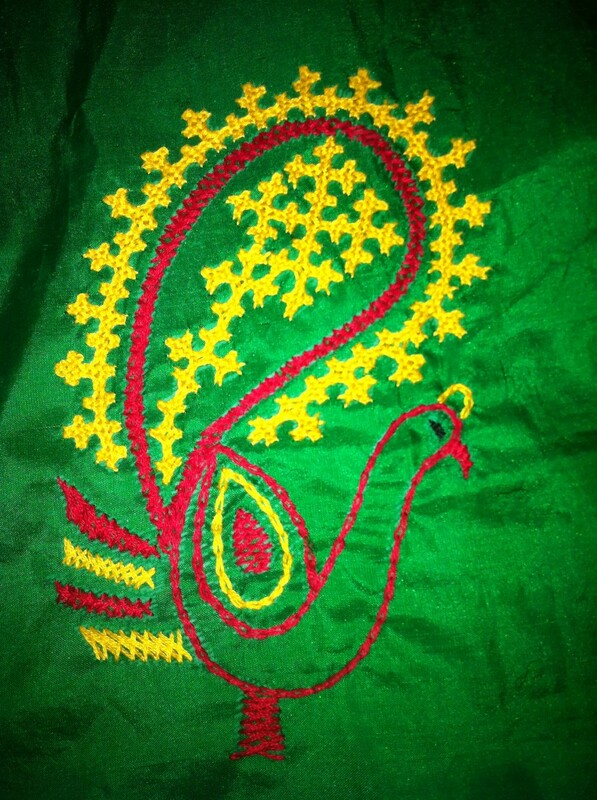 This is so beautiful form of embroidery. I have done embroidery on fabric and cross stitch work but this looks different. I like the geometrical patterns displayed in this hub and getting interested to try this out. Thanks for the guidance. Voted up and pinned!